My latest “can’t put down” book is The Nine: Inside the Secret World of the Supreme Court by Jeffrey Toobin (2007). I have always been interested in court cases (blame Perry Mason!) as well as politics so I thought this might make a good book discussion book. (It would.) My interest then led me to the Modern Scholars audio series, Law of the Land: A History of the Supreme Court. It would be wonderful to take a thorough course in this topic, but until I have time, there are many, many resources to peruse. The outline format and many of the suggestions come from the course guide for Law of the Land. Kutler, Stanley I. The Dred Scott Decision: Law or Politics? On July 20, some of the members of the Book Discussion group joined the Council on Aging to visit Harvard and the Natural History Museum. In April we had read William Martin’s Harvard Yard — a story about a fictional family with tie to Harvard and a lost Shakespeare folio. 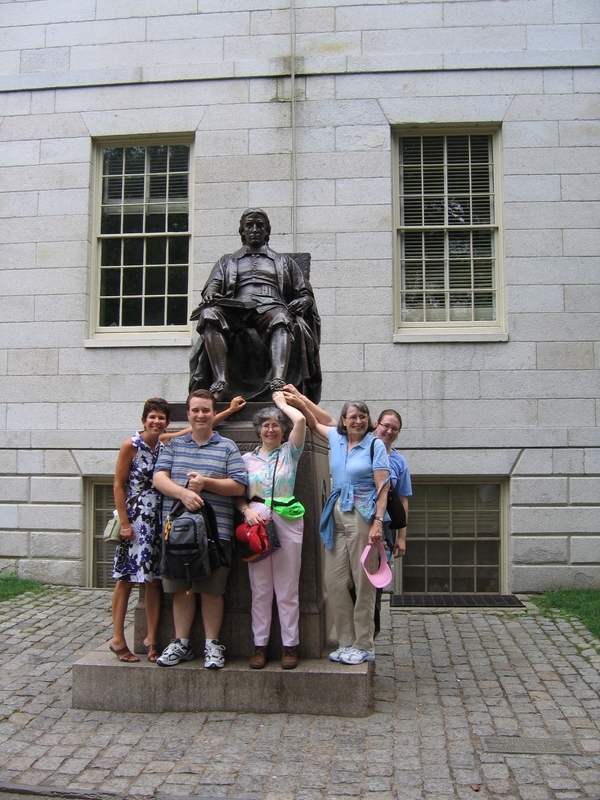 The book really made us interested in Harvard, the oldest university in the US. While we couldn’t go on a tour — no tours on Sundays — we did walk around the campus including Radcliffe where Judy went to college. The Peabody Museum’s Native American exhibits were fascinating, although the Mayan/Aztec floor was too warm for comfort. We look forward to other book related field trips in the future.